BUY PAINTINGS ONLINE BY YASHODAN HEBLEKAR. STILL LIFE PAINTINGS ONLINE ON ARTZYME.COM. YASHODAN HEBLEKAR PAINTINGS ONLINE AVAILABLE ON ARTZYME.COM. 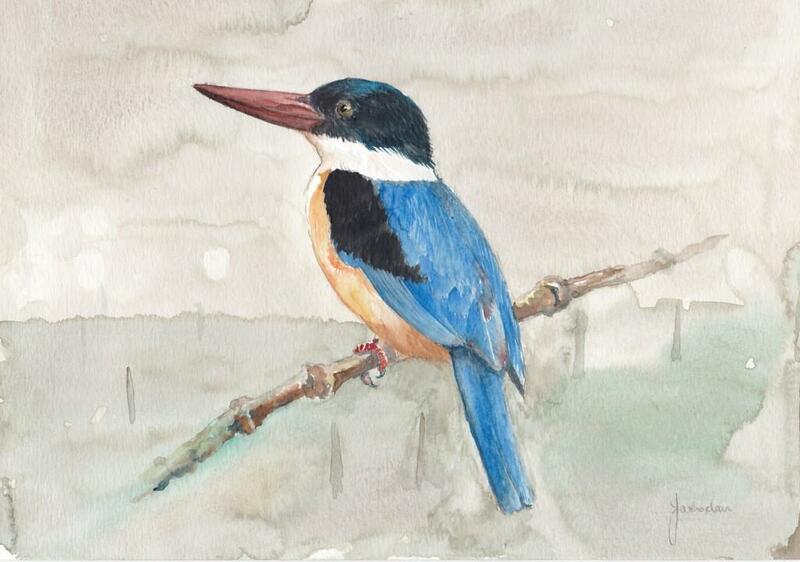 YASHODAN HEBLEKAR IS AN ENTIRELY SELF TAUGHT ARTIST WHO SPECIALIZES IN WILDLIFE ART. HIS PAINTINGS ARE COLLECTED INTERNATIONALLY. HE HAD A PASSION FOR BOTH ART AND WILDLIFE FROM A VERY YOUNG AGE. ACTIVELY INVOLVED IN MANY A CONSERVATION MOVEMENTS RIGHT THROUGH HIS STUDENT DAYS, IT FOUND A PAUSE ONCE THE DAILY GRIND OF JOB AND CAREER BUILDING TOOK OVER. AFTER A FEW YEARS OF MOVING ALL OVER INDIA, HE RELOCATED BACK TO GOA WHERE HE WAS BORN AND GREW UP. THE TINY STATE OF GOA IN INDIA HAS BEEN DEVELOPING AT MASSIVE PACE. ALTHOUGH A BIO-DIVERSE HOTSPOT AND CATCHMENT AREA, IT HAS BEEN SYSTEMATICALLY DESTROYED BY DEMANDS OF OPEN CAST MINING, TOURISM AND REAL ESTATE DEVELOPMENT. ANY NATURE LOVING PERSON COULD NOT AFFORD TO STAY A MUTE SPECTATOR. HE FOUND AN ABLE PARTNER IN HIS WIFE, DR. JYOTI TO FIRST REKINDLE THE DESIRE IN CONSERVATION. THEY BOTH PROMOTED THE BUTTERFLY CONSERVATORY OF GOA A PROJECT TO REFOREST A BARREN HILL SLOPE AND CREATE HABITAT TO ENCOURAGE BREEDING OF BUTTERFLIES AND ALL CREATURES SMALL. THEIR IDEA OF CONSERVATION IS TO BUY OR LEASE OUT LAND TO PROTECT AND CONSERVE. HE NOW CONSIDERS HIMSELF VERY LUCKY TO SHARE HIS BACKYARD WITH MANY VARIETIES OF BUTTERFLIES AND INSECTS - NOT TO MENTION A HUGE VARIETY OF BIRDS AND SMALL MAMMALS. YASHODAN, WITH AN ENGINEERING DEGREE AND MANAGEMENT DIPLOMA, HAS WORKED FOR MOST OF HIS CAREER IN GENERAL INSURANCE A FAR CRY FROM THE TWO FIELDS THAT HE LOVES . IT IS HIS EXCELLENCE IN CHOSEN FIELDS THAT HAS ALLOWED HIM TO INVEST IN CONSERVATION AS WELL AS ART. IN THE LAST FEW YEARS , UPON HIS WIFES GOADING , HE HAS ALSO BEEN CONSTANTLY DEVELOPING HIS SKILLS AS AN ARTIST HOPING TO TAKE A PLUNGE AND COMMIT TO ARTS FULL TIME. ENTIRE SALES PROCEEDS FROM HIS ART ARE CURRENTLY GOING TO THE CONSERVATION WORKS. So cute, love the beak and eyes! !